The Crocodile, like the Island it symbolizes, is a strong and surprising creature, a creature that lays low for a while, but violently fights back when cornered and confined. This music sure breaks a few rules and purposely does it wrong on some occasions. It's postmodern and disruptive. Crocodiles live in the water and on land at the same time. Being a Miami, Florida native of Cuban and multicultural heritage, my music lives on many hyphens as well. I studied piano with Rosalina Sackstein and composition with Dennis Kam at the University of Miami, FL and founded the university’s student chapter of the Society of Composers, Inc. (SCI). My passion for all things Latinx has been expressed through performing Latin American/Caribbean and Spanish classical music in solo concerts, founding an international Latino art and film festival, and producing a documentary on the U.S. immigration crisis, which has won several humanitarian awards. My first album, ¡Coño! (But With A Swing), features 11 original instrumental tracks which includes Ron Bland (bass) and Thomas A. Blomster (percussion). Also on the album are Patricia Surman (flute), Dave DeMichelis (electric guitar), Randy Runyan (trumpet) and Rodney Farrar (cello). Coño! (But With A Swing) was recorded at Rocky Mountain Recorders in Denver, CO and was released on disc via CDBaby.com, as well as digital and streaming on October 5, 2018. All About Jazz musician pages are maintained by musicians, publicists and trusted members like you. Interested? 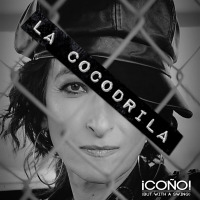 Tell us why you would like to improve the La Cocodrila musician page.